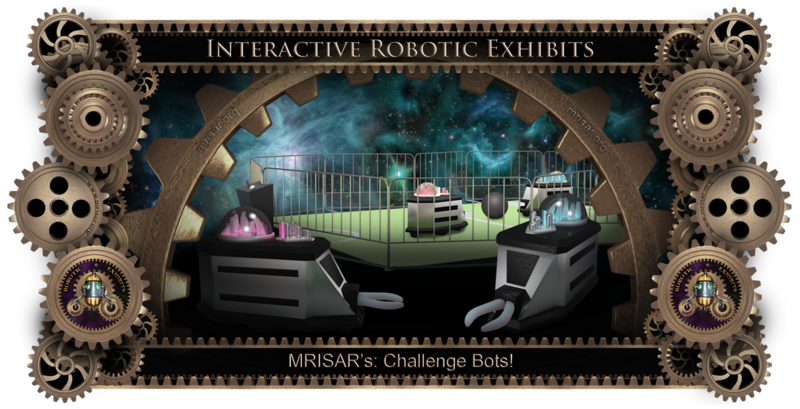 Robotic Exhibit; MRISAR's Challenge Bots Exhibit! Robot vs. Robot! 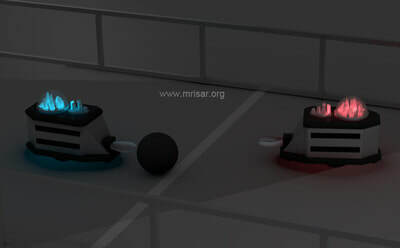 Challenge Bots: Basic description of the activity; Two mobile robots measuring 2’ wide x 3’ long x 2’ tall that operate within a fenced in activity area measuring approximately 16’ x 20’, with two podium-like control panel locations consisting of panels with joysticks and pushbuttons that are used to operate the robots. Frequency and codes are very different for each robot so both can operate without stray signals from each other or other devices in the area interfering. Four ball and foam block type activity challenges are part of the exhibit and are interchangeable in mere minutes. Two are sports type activity contests between robots as human users’ guide them; and two are basic dexterous training tasks. Each robot has a number of electronically animated elements such as LED light arrays, which illuminate frosted and clear acrylic plastic elements such as crystals, columns and the domes. The columns also serve as a status indicator by lighting up in a particular order and color corresponding to the user’s movement selections. 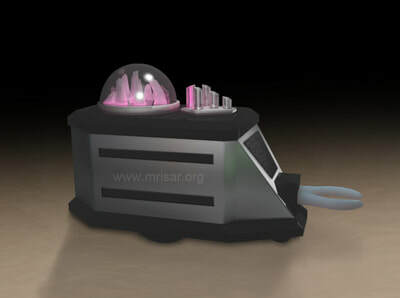 The robots and control panels generate a number of interactive sound effects. In addition to these elements the control panels speak an introduction for the activity and prompt the user during the activity. For the two sports activities the control panels will also keep score and announce when a user wins. The wrist function consists of up and down movements and the hand has open and close movements. The wheeled bases have clockwise, counterclockwise, forwards and backwards movements. The robots feature a number of logical limits and slip clutches which allows the robots to stop moving when they lightly impact an obstacle such as the railing or the other robot. The slip clutches also prevent the robots from exerting excessive force. These features conserve battery resources, reduce wear on the robots components and in general are part of the safety features. 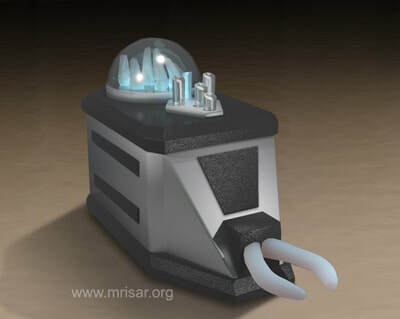 The robots are rechargeable over-night and will easily run for a full day of heavy use between recharging. The purpose of the exhibit is to impart a number of educational principles in robotics in a fun and memorable way. These include, but are not limited to, sensors, limits, electromechanical systems and components. Both Robots come with chargers and a user manual with easy maintenance and setup instructions. As support for the educational aspects the exhibit is also supplied with a series of diagrams and illustrations showing how specific parts operate. 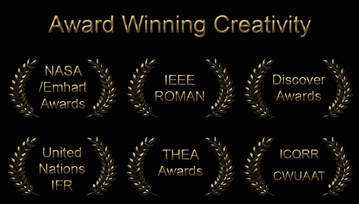 For more information contact us.